Larisa Panz Ph.D., Ksenia Kulbitski and Professor Mark Gendelman, Schulich Faculty of Chemistry at the Technion Haifa Israel. Organo-iodine compounds are used in several applications, mostly as intermediates in organic synthesis because of the easy formation and cleavage of the C–I bond. The analysis of organo-iodine compounds is highly challenging since most of them are not compatible with LC-MS and electrospray ionization while in GC-MS their analysis is hampered via their possible decomposition at the GC injector, column and ion source since the iodine-carbon bond is by far the weakest among all halogen-carbon bonds. Furthermore, even if the organo-iodine compounds elute from the GC column their standard EI mass spectra are often void of any molecular ions and as a result their identification becomes impossible. Motivated by the above challenges we explored the analysis of novel synthetic organo-iodine compounds with the Aviv Analytical 5975-SMB GC-MS with Cold EI, developed a method for its successful analysis and compared the results with that obtained with GC-MS with standard EI. Keep reading to find out how the Aviv Analytical 5975-SMB GC-MS with Cold EI uniquely enables the effective analysis of synthetic organo-iodine compounds and provides unambiguous identification of all the synthetic organo-iodine reaction mixture compounds and as a result helps optimizing the synthesis reaction conditions and yields. Systems: 5975-SMB GC-MS with Cold EI system of Aviv Analytical which is based on the combination of Agilent 5975 MSD with the Aviv Analytical GC-MS with Cold EI with its supersonic molecular beam interface and fly-through Cold EI ion source. As standard GC-MS we used the Thermo ITQ 900 GC Ion Trap MS with standard EI. Injectors: 150ºC injector temperature and in the 5975-SMB we used a Restek deactivated sky liner that did not have glass wool. The standard GC-MS injector temperature was also 150ºC. Samples: Seven organo-iodine samples were analyzed but in this note we report on the data of only one of them. The samples were injected in acetonitrile solvent at about 0.1% mixture concentration and thus with split 20, 50 ng sample mixture were injected on-column. Columns: In Cold EI it was 8 m 0.25 mm ID, 0.25µ film of DB-5MS UI. In standard EI it was 30 m 0.25 mm ID, 0.25µ film of DB-5MS. Oven: In the 5975-SMB GC-MS with Cold EI it was 80ºC with wait 0.5 min followed by 20ºC/min to 300ºC and wait 2 min for total of 13.5 min. SMB transferline temperature: 150ºC with temperature program of 10ºC/min after 4 min to 220ºC. Electron Energy: 70 eV for both systems. As shown in Figure 1 below, the sample was a mixture of a few organo-iodine compounds. However, the most abundant sample compound that eluted in the 5975-SMB TIC trace at about 6.1 min did not elute at all in GC-MS with standard EI. This is perhaps due to its decomposition at the injector or probably since with the time allocated for analysis it did not elute from the 30 m column with 1 ml/min column flow rate. Thus, standard EI missed an important and most abundant reaction mixture compound which was uniquely analyzed by the 5975-SMB GC-MS with Cold EI. mixture using the Aviv Analytical 5975-SMB GC-MS with Cold EI (upper trace) and Thermo ITQ 900 GC Ion Trap MS with standard EI. Note that the biggest Cold EI TIC mass chromatogram peak is missing in the standard EI TIC trace. Click to Enlarge. In Figure 2 we show the Cold EI mass spectrum (upper MS trace) and standard EI mass spectrum (bottom trace) of the first to elute peak in the doublet TIC peaks (2.32 min elution time in Cold EI and 5.22 min in standard EI). This peak belongs to the target organo-iodine synthetic compound. As demonstrated in Figure 2, Cold EI provides highly informative mass spectrum with abundant molecular ion of m/z=248 while standard EI does not exhibit any molecular ion. Evan worse, while no ions at all with m/z=248 are exhibited, a few small ions with other masses are observed and serve only to mislead about the possible identity of the target compound. Furthermore, the low mass spectral range of the standard EI mass spectrum reveals clear indication of intra ion source decomposition of the target compound in the form of m/z=91 and 92 ions of toluene decomposition product (plus other intra ion degradation products) while the Cold EI mass spectrum is free from such adverse effects. Figure 2. 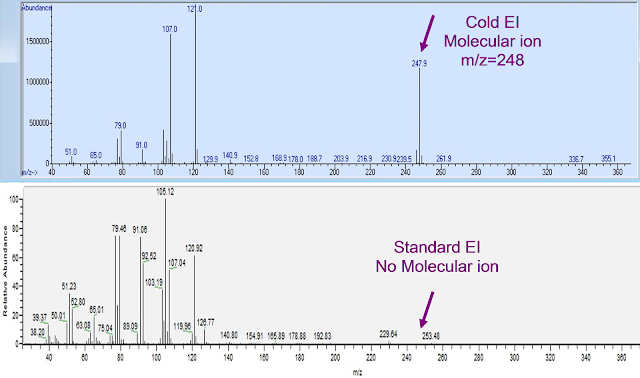 A comparison of mass spectra of the synthesis target organo-iodine reaction product using the Aviv Analytical 5975-SMB GC-MS with Cold EI (upper trace) and Thermo ITQ 900 GC Ion Trap MS with standard EI. Note that the molecular ion is absent in standard EI while it is abundant in Cold EI. 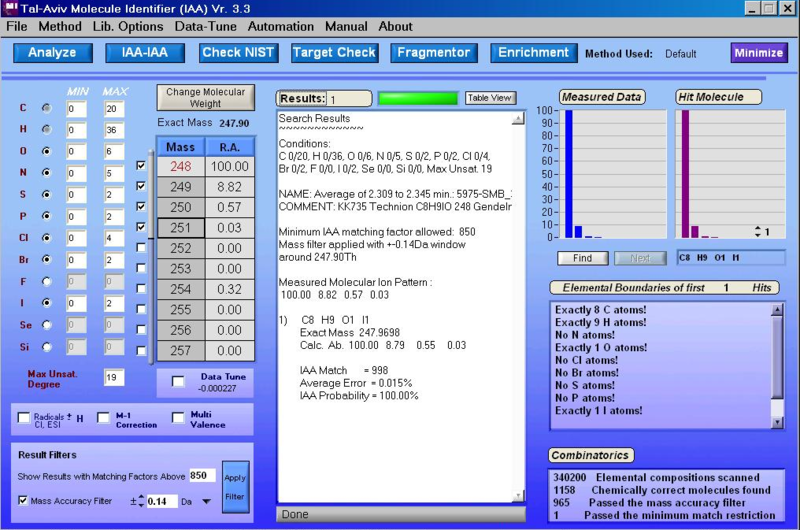 In addition, the low mass spectral range of the standard EI MS shows intra ion source decomposition products such as toluene at m/z=91 and 92. Click to Enlarge. 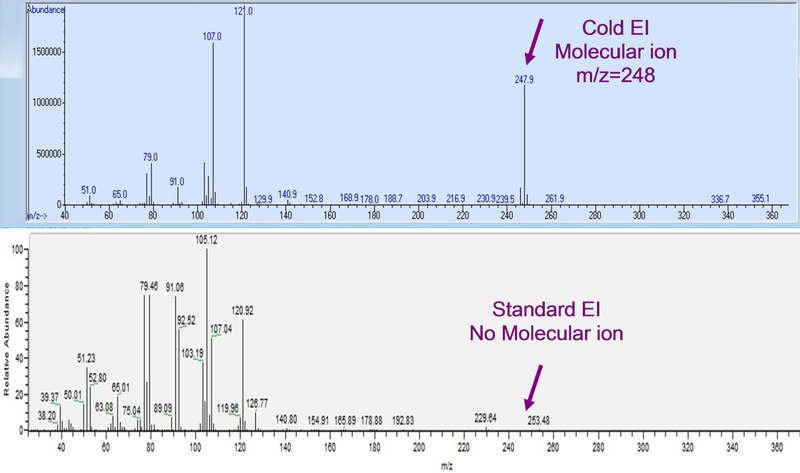 In short, while standard EI provided useless and even misleading information, Cold EI provided accurate and valuable identification information in which the molecular ion is highly abundant and m/z=M-127 is the most abundant fragment ion that clearly indicates the presence of iodine. The synthesis target compound C8H9OI cannot be identified from an EI mass spectrum (Cold or Standard) with the NIST library since this compound is not included in the library. However, the Cold EI MS provides accurate isotope abundances of the molecular ion group of isotopomers. 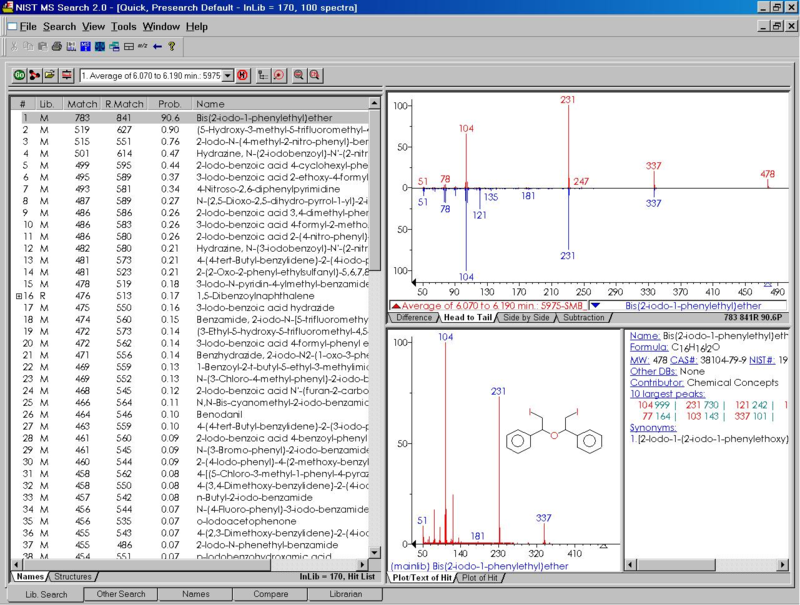 Thus, we used the Tal-Aviv Molecule Identifier (TAMI) software for the elucidation of the sample compound elemental formula. Further information on the usefulness of the TAMI software can be found in our blog post on identification. In Figure 3 the TAMI software search screen is shown, reporting that among 340,200 possible elemental formula with nominal molecular weight of 249 amu, 1,158 are chemically possible and among them only the correct compound with elemental formula C8H9OI passed the required minimum matching factor of 850 with a very high matching factor of 998 and thus its elemental formula is certain. Accordingly, the 5975-SMB GC-MS with Cold EI outperforms high resolution GC-MS (with TOF or QTOF) since its capability of elemental formula provision is similar or better than that of 5 ppm TOF-MS while its ability to elute intact labile compounds and measure their molecular ions is far superior to any GC-MS with standard EI. Figure 3. Synthetic organo-iodine compound identification by the Tal Aviv Molecule Identifier (TAMI) software based on isotope abundance analysis and mass accuracy of +-0.14 Da. Note that among 340,200 possible elemental formula 1,158 are chemically possible and among them only the correct compound with elemental formula C8H9OI passed the required minimum matching factor of 850 with a very high matching factor of 998 and thus its elemental formula is certain. Click to Enlarge. In Figure 4 we show the Cold EI mass spectrum of the main TIC peak which is absent in standard EI. Again, informative mass spectrum is shown with a molecular ion of m/z=478. 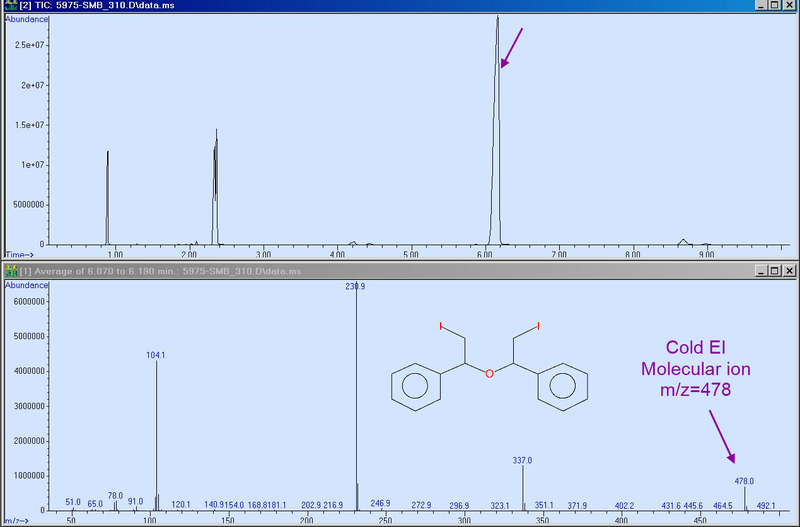 This compound was fully identified by the NIST MS library as Bis(2-iodo-1-phenylethyl)ether and Figure 5 shows the NIST identification which is with a high 90.6% identification probability. Note that while the NIST library mass spectrum is very similar to the experimental Cold EI mass spectrum, Cold EI uniquely provides molecular ion mass spectral peak of m/z=478 which is missing in the library standard EI mass spectrum. However, since the identified compound molecular weight is 478 amu the Cold EI provision of molecular ion further confirms the NIST library identification and the TAMI software further fully supports the NIST library identification with the correct elemental formula of C16H16I2O which is an organo-iodine compound with two iodine atoms. 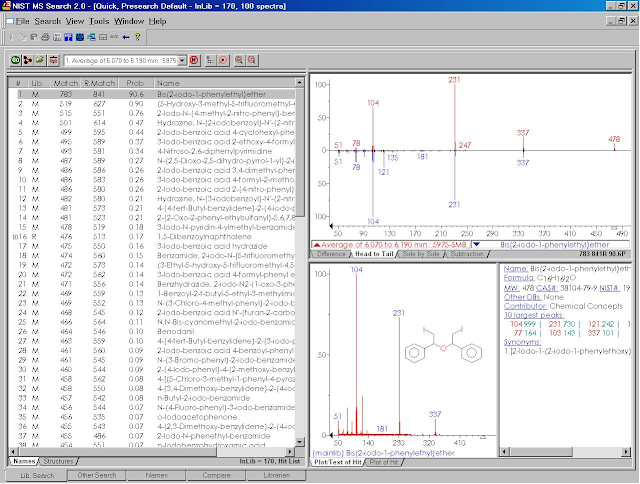 However, unlike with high resolution LC-MS that provides elemental formula, the use of NIST library identification automatically provides also the compound name and structure as shown in the bottom trace of Figure 4. Using this structure it became immediately clear to the synthetic organic chemists that this compound emerged from a reaction of two synthetic target compounds that polymerized while eliminating one water molecule. Figure 4. Cold EI mass spectrum (bottom trace) of the most abundant Cold EI TIC trace (upper trace at 6.2 min). Note the informative Cold EI mass spectrum with molecular ion of m/z=478. The figure also shows the resulting structural formula of this compound. Click to Enlarge. Figure 5. NIST library identification of the most abundant Cold EI TIC trace compound that eluted at 6.2 min. Note the 90.6% high probability of identification and the absence of molecular ion in the library MS that is provided in the Cold EI MS and thus further confirms the sample compound identification which according to both Cold EI and library has a molecular ion of m/z=478. Note that the NIST library, unlike LC-MS with the provision of elemental formula alone, provides also the name and structure of the identified compound. Click to Enlarge. Finally, a very important unique capability of GC-MS with Cold EI is the provision of chemical reaction yields as described in Measurement and Optimization of Organic Chemical Reaction Yields by GC-MS with Cold EI. Cold EI is uniquely characterized by uniform compound independent response. Thus, one can use as shown in Figure 6 the Chemstation percent area report for the Cold EI TIC trace of Figure 4. According to the % area report that is shown in Figure 6, the most abundant compound #5 that is identified and described in Figures 4 and 5 above represents ~72% reaction yield while the reaction target compound which is #2 (Identified in Figures 2 and 3 above) resulted in reaction yield of only 10.5%. 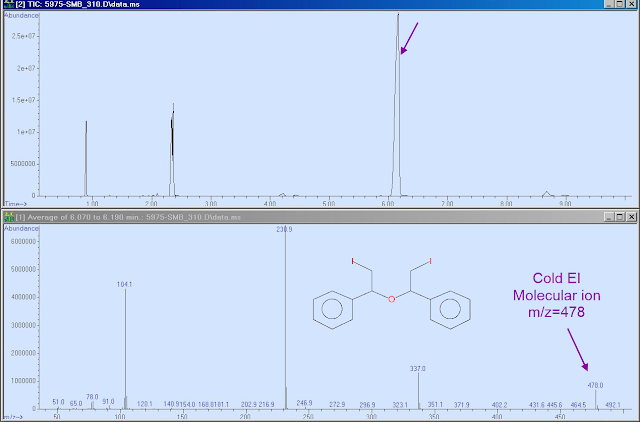 The other two compounds in the TIC were also identified but are not important for this note. Figure 6. Chemstation provision of percent area report for the Cold EI TIC trace as shown in Figure 4. Note that the most abundant compound #5 that is identified and described in Figures 4 and 5 represents ~72% reaction yield while the reaction target compound which is #2 (Identified in Figures 2 and 3) resulted in reaction yield of only 10.5%. Click to Enlarge. As described, the 5975-SMB GC-MS with Cold EI is uniquely suitability for the analysis of Organo-Iodine compounds and related chemical reaction mixtures. In fact, the difference between its performance with this class of compounds and that of GC-MS with standard EI is like between useful and useless. Thus, the 5975-SMB GC-MS with Cold EI can help in the identification of reaction products, deepens our understanding of the reaction mechanism and helps in the optimization of organo-iodine reaction yields.